Magne was in Bodø last Thursday, March 9th, for the opening of another exhibition of his Texture collaboration with HM Queen Sonja. This is the fifth out of six planned Texture exhibitions in Norway and the UK. “It’s fun for me to see this exhibition [in Bodø], as it includes some works that haven’t been shown before. Particularly the monotypes, unique prints that we have made together with double signatures, are quite special”, Magne told the audience at the opening in Bodø Kunstforening. 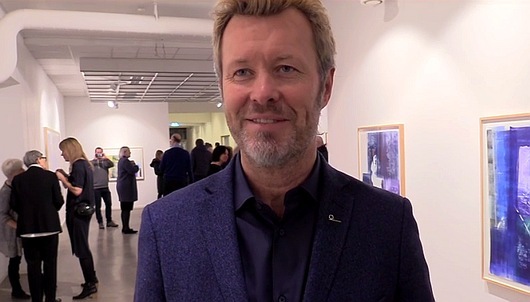 A gallery of pictures from the opening has been posted on Bodø Kunstforening’s Facebook page, along with two video clips of Magne speaking (Video 1 / Video 2). Press reports from the opening include an article at bodonu.no and a short clip on NRK Nordland‘s local TV news. The following day Magne made a visit to Kjerringøy near Bodø. The final stop on the Texture exhibition tour is at Gulden Kunstverk in Steinberg, where it opens on 29 April. Sadly, this weekend also brought news that the poet Henning Kramer Dahl passed away on 7 March from heart failure, at the age of 54. He was part of a-ha’s inner circle and knew the band members from early on. 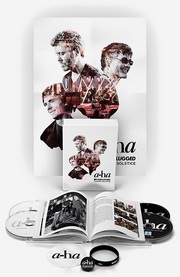 In 1986 Kramer Dahl wrote the book Så Blåser Det På Jorden together with Håkon Harket, which chronicled the beginnings of Bridges and a-ha in the late 70s and early 80s. He would later collaborate with Magne on a number of projects, including Blåtoneboulevardene (1997), Stjerneskutt (2004) and In Transit (2013). He also co-wrote the song “East-Timor” for Morten’s Wild Seed album in 1995. Magne, Håkon Harket, Lasse Kolsrud and Fredrik Skavlan have written an obituary about Kramer Dahl in Aftenposten. “We have lost a very special person, an important presence in our lives, and the world has lost a distinctive poetic voice and an extraordinary intellect”, they write in the obituary.